Gov. Robert Bentley issued an Executive Order on Thursday establishing a state-level committee to make recommendations to implement the Every Student Succeeds Act, which replaced No Child Left Behind (NCLB) last December. 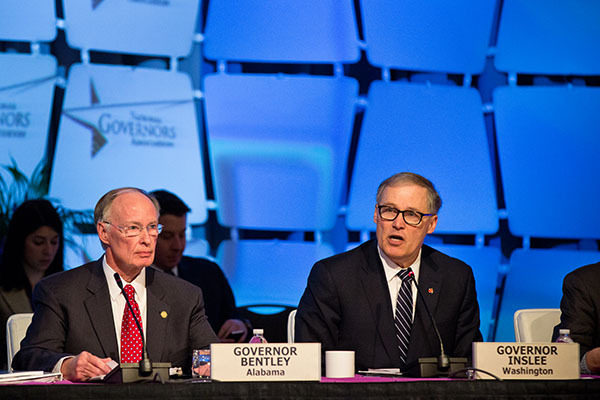 Feb. 21—Washington Governor Jay Inslee, chair of the National Governors Association’s Education and Workforce Committee, along with Alabama Governor Robert Bentley, vice chair of the committee, co-led the discussion Sunday afternoon on implementing the Every Student Succeeds Act. Source: National Governors Association. Though regulations for implementing ESSA are not expected to be finalized for many months, Bentley has given his newly-created committee until December 1 to make recommendations for implementation. While waiting for Congress to reauthorize NCLB, President Barack Obama granted state departments of education the flexibility to request waivers from parts of NCLB in exchange for a commitment to three principles: (1) transitioning to college- and career-ready standards and assessments, (2) developing systems of differentiated recognition, accountability, and support, and (3) evaluating teacher and principal effectiveness and supporting improvement. Alabama requested and received a waiver after creating a plan that met federal requirements. All waivers expire August 1, 2016. Full implementation of ESSA begins July 1, 2017. 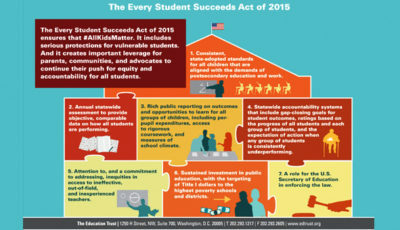 The biggest change from NCLB to ESSA is that states are now in control of their own accountability systems and federal law does not dictate the actual weight or importance of any elements of those systems, though specific elements are required, including measures of achievement, graduation, English language proficiency rates, and others chosen by the state. Student achievement results must still be broken out by subgroup, including race, ethnicity, poverty status, disability status, and English language learner status. State accountability plans must be peer-reviewed and approved by a committee at the federal level. That leaves a lot of work for states, many of whom are taking the opportunity to completely revamp their accountability systems. Because ESSA requires states to “establish a system of meaningfully differentiating, on an annual basis, all public schools in the State, which shall be based on all indicators in the State’s accountability system…for all students and for each subgroup of students,” it implies that some sort of rating system must be developed. Along with crafting accountability measures that will be used to differentiate schools, states must publicly report certain accountability-related elements. Those elements are listed here. Alabama currently reports required elements through it’s annual report card. In 2012, Alabama lawmakers passed a law requiring the use of an A-F grading system for all schools. Lawmakers said at the time it was to allow the public to get a better understanding of how their schools were doing. The ALSDE has yet to implement the grading system, due in part, officials say, to the inability to measure student growth data in a statistically valid way during the change from using the Alabama Reading and Mathematics Test (ARMT) during the 2012-2013 school year to using the ACT Aspire during the 2013-2014 school year. State officials maintain that multiple years of data are needed in order for the growth measure to be valid. The ALSDE formed a task force to determine which should be included in the report card in 2012. State Superintendent Dr. Tommy Bice said at the state board of education work session last week he intends to finalize the A-F report card elements before retiring at the end of the month. He asked the board to give him a directive to implement a set of guidelines for the A-F reporting system based on four sets of report cards he shared with them reflecting various viewpoints, including the results of the task force’s work. The A-F grading system has become a point of contention with the legislature, as lawmakers continue to make disparaging remarks about how the ALSDE hasn’t yet implemented it despite its passage nearly four years ago. “I’ve taken a lot of heat for this thing not getting done,” Bice said, but added he “owned” the blame. A number of the landmark education reform bills passed by the legislature since 2012 rely in some form on the A-F grading system, including the determination of “failing schools” under the Alabama Accountability Act. Until the A-F system is put in place, schools whose overall measured student achievement lands them in the bottom 6% statewide are labeled “failing” schools. Alabama currently has 76 schools listed as “failing” schools. According to the Education Commission of the States, as of December 2013, 14 states, including Alabama, either already were using or considering the use of A-F report cards for their state accountability systems. Since that time, the use of A-F report cards has proven controversial in many states, and Arizona recently suspended their use of A-F labels as they transition to a state-created accountability system. Virginia repealed their A-F system in 2015 as well. It is unclear whether the A-F grading system will be a part of the ESSA Implementation Committee’s work, but having two different ratings, one for state accountability and one for federal accountability, would be confusing. 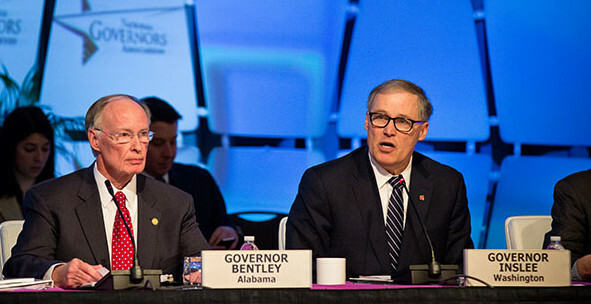 Bentley, who serves as president of the state board of education, also serves as vice-chair of the Education and Workforce Committee of the National Governors Association (NGA). The NGA held its winter meeting in late February, where the Education and Workforce Committee discussed how it would proceed in implementing ESSA. Here’s video of the full session. 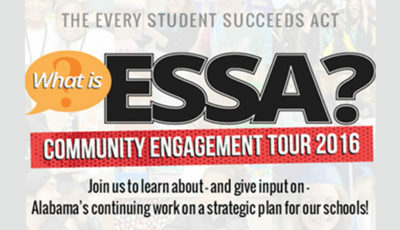 During the meeting, Bentley announced the formation of the NGA’s ESSA Implementation Task Force, which includes a number of education advocacy groups across the spectrum, including the National School Boards Association and the National Education Association. U.S. Sen. Lamar Alexander (R-TN) recommending to National Governors Association members to form a state coalition to implement ESSA requirements. Screenshot from NGA web site. In remarks during the meeting, U.S. Sen. Lamar Alexander (R-TN), urged governors to take a leading role in implementing ESSA and outlined a framework for building a state coalition to implement ESSA. Alexander and Sen. Patty Murray (D-WA) are credited with gaining bipartisan support and ultimate passage of ESSA in the Senate. During the meeting, Alexander recommended to governors to include superintendents, legislators, school boards, teachers, principals, and parents as part of the state coalition. While those roles are not formally defined in Bentley’s executive order, people in those roles could end up serving on the committee. The Governor has given himself seven appointments to the committee, with three holding titles already as a result of an earlier appointment, and four more to be named as indicated below. There is also an option for the Governor to appoint additional members as needed. The state board of education will appoint 16 members, and the state superintendent will appoint two members. The committee chair will be appointed by the Governor from among the members. The order calls for the committee to collaborate with the Alabama State Department of Education. The committee must submit its recommendations to the Governor, the Alabama State Board of Education, and the ALSDE by December 1, 2016. When asked why Bentley chose to use an Executive Order to create the committee, a spokesperson directed me to the Governor’s office’s press release but did not offer further comment. 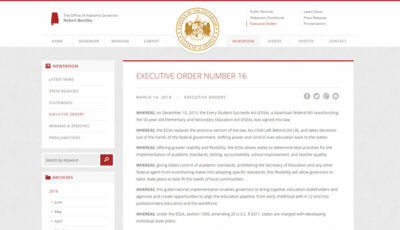 This is not the first time Bentley used an Executive Order to implement an education-related task, having created the College- and Career-Ready Task Force in 2013. Here are their 2014 recommendations, which included formation of the Alabama Workforce Council. The Alabama Workforce Council in turn recommended creating a P20W longitudinal database that Bentley created through Executive Order in May 2015. The creation of the database stalled after funding proved elusive. Rep. Terri Collins (R-Decatur) introduced HB125, which further establishes and provides funding for the longitudinal database. That bill has made its way through the House and a Senate committee, but awaits passage by the full Senate. We are awaiting comments from the ALSDE and will add those comments when they are received.